One megawatt-hour of solar-produced electricity in North America currently costs $50, compared to $102 for coal-originating power, according to new analysis. New solar installs are contributing the same amount of electricity as building one new coal-fueled power station annually in Australia, according to the head of the Australian Energy Market Operator (AEMO). “We are essentially seeing the [equivalent] of a new power plant being built every season,” AEMO chief Audrey Zibelman told the Sydney Morning Herald. One reason rooftop adoption in Australia is exploding, the paper wrote, is because of government subsidies. However, there’s another financial driver of alternative power globally, which is the full-lifecycle cost of building and operating — it’s now lower. 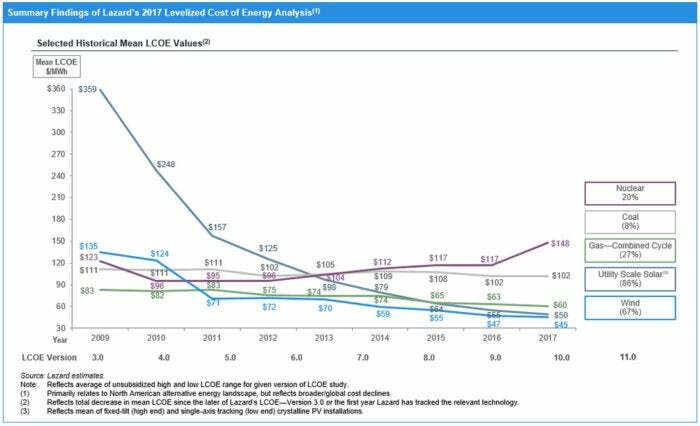 Lazard says the cost of producing one megawatt-hour of solar-produced electricity in North America is currently $50, compared to $102 for coal-origination. It says that in 2009 it would have cost $359 to produce that level of power with utility-scale solar arrays, and $111 with coal-fired power stations. Wind-power comes in even cheaper at $45 per megawatt-hour today. The investment bank uses a special calculation, called the Levelized Cost of Energy Analysis (LCOE), in the November 2107-published analysis. LCOE computes the unit cost of power over the lifetime of the generating asset, such as power station or wind farm, and takes into account lowering prices for components such as racks, PV panels, inverters and turbines, among other elements. Uncertain long-term fuel costs required for traditional power generation “close formerly wide gaps,” Lazard explains of its numbers. There are also significant, newfound efficiency gains that get thrown in the LCOE mix. In fact, the latest solar panels are so efficient they don’t actually need sun. “Today’s panels are more durable, efficient, and can handle all kinds of weather for many years,” says Jason Rothman, writing on solar-system vendor Hahasmart’s blog. Germany, for example, a Northern European country not known for its beach weather, produces much solar power, Rothman says. That’s because, contrary to what you’d think, solar efficiency is actually reduced in high temperatures. In high temperatures, heat causes the electricity to be converted into even more heat — not power. Clouds, too, don’t block the solar rays needed to run the panel anymore, and rain cleans the panels, making it more efficient. More advancements in solar panels are coming on stream, too. I recently wrote about experimental panels that create electricity from raindrops’ friction, as well as from sun. New battery technology is also being developed. One promising idea is a water-based battery being developed at Stanford University that could feed stored sunny-day alternative energy into the grid when demand is high or at night. It’s not practical right now, the researchers say, but will be. And storing energy in hydrogen gas using industrial salt and water would be cheap — much cheaper than lithium-ion. “It would cost a penny to store enough electricity to power a 100 watt lightbulb for twelve hours,” Stanford says in an article on its website.